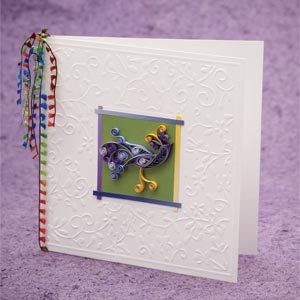 I'm excited that quite a few readers have expressed interest in giving quilling a try! Be on the lookout for a Valentine Quilling 101 tutorial that will be available soon at Craftzine, but until then, here's an abridged version of the Quilling Basics article I wrote for CardMaker Magazine a couple of years ago, as shown this month in the publisher's online newsletter. One of the patterns, a whimsical little bird, can be found here. Also, you might want to check out the right sidebar on this page where you'll find quite a few tutorials for simpler projects, perfect for beginners. And as always, if you have specific questions, don't hesitate to ask in the comments section and I'll do my best to answer. This is great Ann, thanks! I'll be checking these out and I'll be on the lookout for the Valentines tutorial for sure. Wow is that spider in your right sidebar really a beginner project? It says in the tutorial that it's not that hard to make but it looks amazing! I can't believe it's made from paper. Yes, it really isn't hard, once you know how to roll and shape the tight coils (body, head, and eyes). Just follow the step by step directions for the legs and antennae. I know you can do it! Nothing about quilling is hard once you put in some time getting familiar with the basic shapes. I'd love to link to this tutorial on my blog. I did a little practicing today- Nothing great and I improved on the materials. I definitely want to work my way up to that spider! Sure thing, Meg, a link would be great. I'm positive you'll be able to make the spider before long. Have fun! Hi Ann, Can you let me know if it's ok to use one of the picture from this post? I'll of course link to you and the artist.